A lyrical mix of memoir, travel writing, and environmental history. 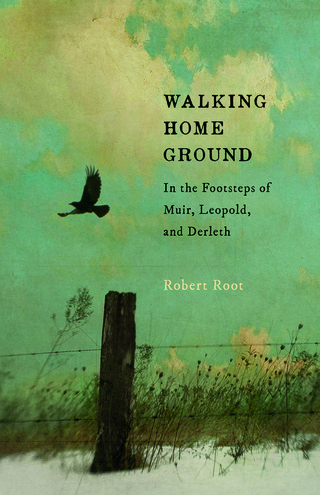 When longtime author Robert Root moves to a small town in southeast Wisconsin, he gets to know his new home by walking the same terrain traveled by three Wisconsin luminaries who were deeply rooted in place -- John Muir, Aldo Leopold, and August Derleth. Root walks with Muir at John Muir State Natural Area, with Leopold at the Shack, and with Derleth in Sac Prairie; closer to home, he traverses the Ice Age Trail, often guided by such figures as pioneering scientist Increase Lapham. Along the way, Root investigates the changes to the natural landscape over nearly two centuries, and he chronicles his own transition from someone on unfamiliar terrain to someone secure on his home ground. This quiet, contemplative and profound book is a celebration of love of places from one of our best thinkers about love of place. A contemporary writer explores the landscape of his new home in the footsteps of earlier writers. This anthology is the comprehensive, indispensable introduction to the way creative nonfiction is written today.